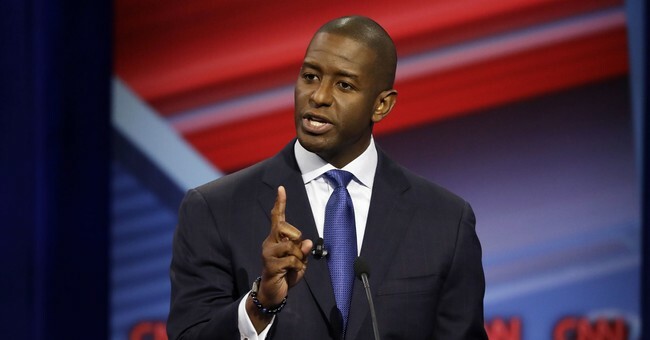 Andrew Gillum, Democratic candidate for Florida governor and Tallahassee mayor responded Tuesday evening to reports that he unethically accepted Hamilton tickets from an undercover FBI agent. Gillum maintained his innocence and argued that Republicans were attempting to reinforce “stereotypes about black men,” by bringing up the accusations. The newly-released text messages from a federal investigation into corruption in Tallahassee indicate Gillum may have known that the undercover FBI agent, who was going by the name Mike Miller, was providing the tickets, despite previously saying he received them from his brother. In an August 8, 2016 message, Gillum’s friend, lobbyist Adam Corey, texted him saying, "Mike Miller and the crew have tickets for us for Hamilton tonight at 8pm," adding, "I think your brother has already arrived by the way." Gillum's campaign claims that text doesn't contradict Gillum's story and that his brother was part of the "crew" referenced in the text. In his Facebook Live video, Gillum called the newly-released text messages "distractions" from his campaign message and repeated that he had received the tickets from his brother. "What I wanted to make sure that folks understood was that these messages only confirm what we have said all along," he insisted. "We did go to see 'Hamilton.' I did get my ticket for 'Hamilton' from my brother. At the time we believed that they were reserved by friends of Adam's, Mike Miller." "When I got there after work -- got my ticket, we went in and saw it, assumed my brother paid for it and so far as I know that was the deal," he added. "The goal is obviously to use my candidacy as a way to reinforce, frankly, stereotypes about black men," Gillum claimed regarding Republicans invoking the newly-surfaced messages. "The Republicans obviously want to distract, want to suggest– all along on the trail they’ve wanted the people of this state to believe somehow I haven’t deserved what I’ve gotten, I’m unethical, participated in illegal and illicit activity. I mean, you name it," he said.